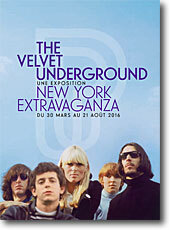 A part of this exhibition, "Sur les traces acharnées du Velvet Underground", was about the Velvet Underground. A catalogue was edited in collaboration with Les Inrockuptibles magazine. First floor was historical evocation with photographs, records, posters, films, Rudi Stern's slides used during concerts, texts and VU members' objects. Photographs by Billy Name, Mark Brusse, Nat Finkelstein, Sanford Schor, Philippe Halsman, Fred McDarrah, Donald Greenhaus, Stephen Shore and Hervé Gloaguen. 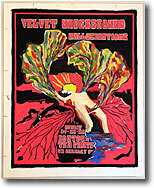 Films presented The Velvet Underground live (Ronald Nameth's E.P.I. and Jonas Mekas' Psychiatrists Convention) or during rehearsal at the Factory (Warhol's Symphony Of Sound). The day of opening on June 15, John Cale and Lou Reed played some Songs For Drella before an unexpected reunion with Moe Tucker and Sterling Morrison for an Heroin performance. This first exhibition came up in the Phonotek of the Hamburger Kunsthalle. In addition to the printed catalog-box, it was the combination of an installation of tape decks that played the most important recordings together with the exhibited records, books, posters, and photographs that illustrated the work of Andy Warhol and the Velvet Underground. Also, the most influential work of such great artists as Angus MacLise, Gerard Malanga, La Monte Young, and Maria Zazeela was displayed in some examples. A very important part of the catalog box and the exhibition were the wonderful photos by Lisa Law. The second exhibition came up in a much bigger setting in an exhibition space named the Zeughaus. Of course, the idea and the concept for the exhibition was nearly the same than the first time, but the exhibition space could be divided in special sections. That made possible for every aspect to be documented on its own. It was possible to invite Nat Finkelstein, Gerard Malanga, Sterling Morrison, Maureen Tucker, La Monte Young and Maria Zazeela to show parts of their most influential work in the context of the Warhol/Velvets history. Lots of rare books, posters, records, photographs, and drawings were displayed for the first time. A program of films by Gerard Malanga, Jonas Mekas, Paul Morissey, Ron Rice, Jack Smith, and Andy Warhol took place as a side program during the weeks the exhibition was opened. The Velvet Underground is one of the most influential bands in the history of rock and roll. Its principal members included Lou Reed, John Cale, Sterling Morrison and Maureen Tucker. They formed in l965, performing live music for poetry/film performances at the Cinematheque in New York. Andy Warhol began to work with the Velvets after seeing them perform at the Cafe Bizarre in Greenwich Village in December l965. He soon introduced the former model Nico (Christa Paeffgen) as the group's chanteuse. Together they performed in New York and on tour in Warhol's performances Up-Tight and The Exploding Plastic Inevitable, and at his club The Gymnasium. 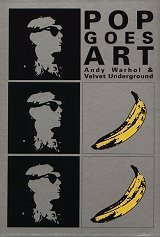 Warhol created the well-known Banana cover for the group's first album, released in March 1967. As the "house band" for the Factory, they were a significant presence in the artist's films, books, and performances. After leaving the orbit of Warhol in the summer of 1967, the band survived personnel changes and recorded three studio albums until their final performance in the summer of 1970. 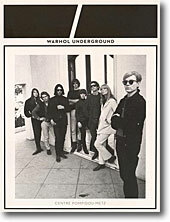 The Velvet Underground's influence included the poet Delmore Schwartz, doo-wop rock and roll, and the composers John Cage and La Monte Young. In turn, their songs have influenced musicians ?from David Bowie to REM. The Velvet Underground was inducted into The Rock and Roll Hall of Fame on January 17, 1996. Most of the material in this exhibition is on loan from The Martha and Sterling Morrison Collection. "In conjunction with Extended Play: Between Rock and an Art Space, the Photographic Resource Center presents The Velvet Years, 1965-67: Warhol's Factory, Photographs by Stephen Shore and Velvet Rarities: From the Collection of Jay Reeg from May 9th through July 6th. The Velvet Years is an exhibition organized by the Rock and Roll Hall of Fame and Museum, and depict the scene at Warhol's Factory from 1965 through '67, a time when he was emerging as a prominent visual artist and film maker. Among the regulars at the Factory during these years were the Velvet Underground, who Warhol promoted and showcased in his multi-media shows known as the "Exploding Plastic Inevitable." Shore's photographs portray many of the musicians, actors, writers, and Factory regulars. Revealing as portraits, Shore's art captures a time and place of seminal importance in the development of American popular culture. The Velvet Years is accompanied by a book of the same title published by Thunder's Mouth Press in 1996. Stephen Shore has exhibited and published widely, including one-person shows at the Metropolitan Museum of Art, the Museum of Modern Art, New York, and the Art Institute of Chicago. Shore has been chair of the photography department at Bard College since 1982. Velvet Rarities: From the Collection of Jay Reeg will present a variety of objects and ephemera related to the Velvet Underground and assembled by Massachusetts based collector Jay Reeg. This small exhibit will show rare photographs, posters, album covers, and other materials related to the band, as well as materials related to the Velvet Underground's musical successors, such as Willie Alexander and Patti Smith."